No bake, chocolate oatmeal bars! – for the Chocolate Lover. Who loves chocolate? I do! In fact I’m guilty of being one of those well known ‘chocolate addicts’. Not the most helpful addiction, when I’m a general tagged ‘fitness freak’. So as most of us have done in the past, I’ve tried quitting chocolate, chocolate bars, chocolate ice cream, etc. Etc. But likewise most of us can definitely say that removing chocolate from our lives is only successful for short periods of time until we give in to the dark side (and here I mean literally)! …Therefore I found a solution! 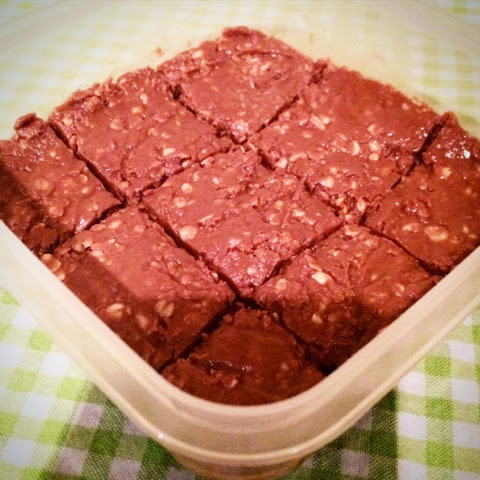 My chocolate oatmeal no bake bars! I made them this past weekend, posted a picture on my social media networking profiles and had a few people ask me for the recipe, so I thought it would be a great idea to post them on here! Before I write down the general recipe, you must remember that there is NO right or wrong to this, there’s no definite ‘ingredients’, and there’s no certain ‘quantities’ to making these, therefore as well as being an amazingly tasty plus healthy substitute to your favourite chocolate bar, they’re also extremely spontaneous and fun to make! – Chocolate (light, or some type of diet chocolate), milk, dark or white, chocolate chips, root around in your baking cupboard, or look down the baking isle at your local supermarket and see what you can find. I personally use cooking chocolate, it’s not calorific and super easy to melt! – Honey, totally optional, depending really on what you’re putting in your bars, how sweet you want them to be, and of course whether you actually like honey or not. I personally don’t use honey in my bars that use more chocolate and peanut butter, I prefer to use honey in my bars that use more nuts and seeds, to gain a more cereal bar type outcome. Also honey adds highly to the sweetness so bear that in mind and if you are going o use honey, use amount to preferred taste. – Peanut Butter if you love Snickers, then this is definitely an ingredient for you! – Nuts any type! Some of my favorites for this recipe are almonds, cashews and hazelnuts. – Fruit, any type of DRIED fruit, cranberries, raisins, apricots, the list is endless. I just use what I can find in my cupboard at the time. Tip: if you have bigger pieces of dried fruit you can cut them into sultana sized pieces (just so they look nicer in the bars). – Oats, last but not least, the main ingredient, pure and simple oats, any type. I use porridge, (breakfast oats). Melt the chocolate (in a bowl which is placed in a pan of water, set on the cooker to boil) until it is nearly to a runny texture, but not quite there yet, add in the peanut butter, honey if you’ve used them and here is the perfect opportunity to taste your mixture. Depending on how much chocolate you have used, will depend on how much peanut butter and honey you will use, also will be dependent on your preferred taste. I personally use about half a bar of cooking chocolate, as I use the least possible amount of chocolate to achieve the same great taste. After you are happy with the taste of your mixture, eg. Right amount of peanut butter, honey and chocolate- remember you can always balance it out if you’ve added to much of one ingredient, by counterbalancing with the other ingredients, e.g. If you’ve put too much PB just add a little more chocolate until it’s perfect. You will notice at this point that the mixture is still quite sticky, and won’t be easily scraped from the bowl, this is where the butter or coconut oil comes in. Add in just enough butter or coconut oil, until the mixture has a runny and smooth texture and is not sticking to the side of the bowl. Lastly add in the Nuts/ fruits which you have chosen to add in, then complete the mixture by adding as much oats in as it takes to attain a ‘cereal bar type texture’. Fold that all in super nicely, mix it around a little bit, then pour it all into a plastic Tupperware! Put it into the fridge, check on it every 10-15 mins, as depending on the amount you’ve made, it will cool at different rates. When they are half cooled, yet still soft, don’t forget to run your knife through the mixture to cut them into ‘bars’ then pop them back in the fridge, until hardened. And there you have it, your super easy, no bake oatmeal bars. Easy, quick to make, waaaay healthier and cheaper than chocolate bars, you can add whatever you want in them to mix it up a little bit. Experiment, make them different every time! And the BEST thing about these? They really stop your cravings, this really shocked me, normally with chocolate, I eat some then just want more and more and more. After I’d made my first batch of these, they tasted sooo good I thought I’d end up eating the whole lot, but I was so surprised that after just two squares I didn’t want anymore and had enough for the next few days, for me and for my husband’s lunch snack! The reason why? Well I figured, it’s just a tiny square, that contains sugar, carbs, fruit and good fat all in that little square, which covers everything your body is asking for to overcome a craving! ← Married to my best friend?